Just 1½ miles from Bala, Glynrhedyn is a most exceptional stone and slate detached period country house which has been carefully restored retaining many of its original Victorian features. Approached from a gated private driveway and set in approximately 5 acres of enchanting woodland and river with 2 natural waterfalls and dipping pool, a convenient fallen tree offers a precarious and often hilarious river crossing. A small tree house, a wooden bridge and numerous winding pathways and hiding places make this an exciting wonderland for children to explore and play. Badgers, foxes and squirrels are frequent visitors to the extensive gardens and grounds. Several steps from riverside parking area lead to front door entrance. Spacious airy entrance hall. 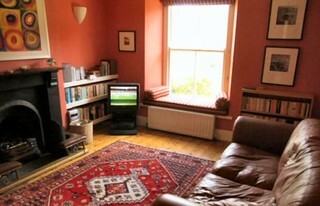 Cosy, intimate period sitting room with open fire and a wealth of bookcases. TV and video. 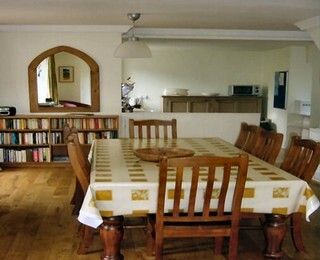 Large and spacious dining room and integral kitchen. Dining table for 8, Many windows with window seats taking advantage of the stunning panoramic views in all directions. 2 pairs of French doors leading to timber decked balcony and stone terrace with steps down to riverside path, the other directly into the large furnished conservatory. From here an entrance door leads out to the terrace. A cloakroom with WC and wash hand basin are integrated into the Utility room off the hallway. The utility room has additional fridge freezer, washing machine and tumble dryer. Staircase to first floor with galleried landing. Very spacious master bedroom with king-sized bed. Mountain views from the 3 windows in this room. 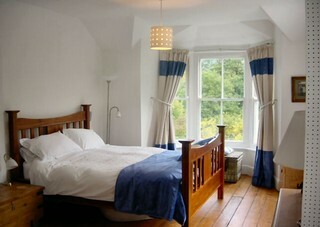 Double bedroom, twin bedded room, single bedroom. Guest bed available for 1 extra guest. Bathroom with step-in tiled shower, cast bath tub, WC and wash hand basin. Travel cot, safety gate, highchair available. 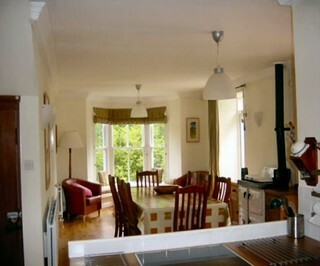 • Full oil-fired central heating, open fire in sitting room. • Electric cooker with ceramic hob, dishwasher, fridge, fridge-freezer, toaster, cafetiere, coffee grinder, Brita filter, toaster, microwave oven. • Washing machine and tumble dryer. • 2 colour TV’s, video, portable radio/cassette/CD player. • Lockable garden store for safe storage of bicycles. Barbecue and garden furniture, security floodlighting to gardens, parking and driveway. • Parking for up to 4 cars. • Telephone - incoming calls only. Limited mobile reception indoors, which improves just outside the house. A Housekeeping Bond cheque of £300 cheque should accompany the Booking Form. This is returned after the house has been cleaned and found to be in the same condition as on guests arrival with no repairs, replacements/extra cleaning required. Footpaths abound with walking access to Bala Lake, the Bala Lake Railway, Sailing Club and Bala Lake Hotel. The opposite shore offers Bala Adventure & Watersports, the Foreshore and Leisure Centre.